“Lit,” or the feeling of energy that occurs when something amazing or exciting is happening, is how sophomore Joy Hill, 16, describes the aura of Broome Street Academy (BSA). BSA is a charter high school in New York City’s Soho neighborhood that grew out of The Door, the youth development center that shares the same building. It was granted a full five-year renewal earlier this year — a notable accomplishment for a charter school that’s only in its fifth year — and just last week was one of seven high-performing city charter schools to receive a $3.5 million state grant to share its best practices with district schools. Broome Street Academy was also selected to be one of New York City Mayor Bill de Blasio’s Community Schools, 130 high-needs schools that serve as community centers, providing social services and family engagement and focusing on students’ mental, physical and emotional health, as well as their academics. Some 78 percent of BSA graduates have been accepted into college — making many of them the first in their families to go — and 89 percent of the current senior class are on track to graduate. Nationally, fewer students, 82 percent, graduate. Three years ago, there was a fight outside of BSA so bad that nearly half the student body got suspended. More than 100 students were involved in the brawl, with the situation escalating to the point that police from the local precinct arrived and dozens of students were handcuffed and subdued. Suspensions were doled out in 10-, 15-, and 25-day increments. Chaos ruled. Enter Barbara McKeon as principal, and three years later, it’s now hard to imagine a fight of that magnitude breaking out at this school. The energy in the halls is boisterous, bright and loud — positively lit. The student body of Broome Street Academy is pulled from some of the lowest-income neighborhoods in the city: 50 percent of the seats are set aside for homeless or transitionally housed youth, or those involved in foster care or the welfare system. Outside distractions and tragedy often seep into school: One student, McKeon recalls, came home from school to find his dad had been deported; another was pregnant without anyone realizing it. For many of the students, there are no trustworthy adult figures to whom they can look. As a result, when McKeon arrived at BSA, she found there was no trust anywhere — not between the students and certainly not between the teens and their teachers. Trust, she knew, was vital for community relations, and it needed to start with adults both in the school and the larger neighborhood. So she set out to change things. First, McKeon went to the nearby precinct and brought two of the officers who had been present the day of the fight to speak to the students and extend an olive branch of sorts. 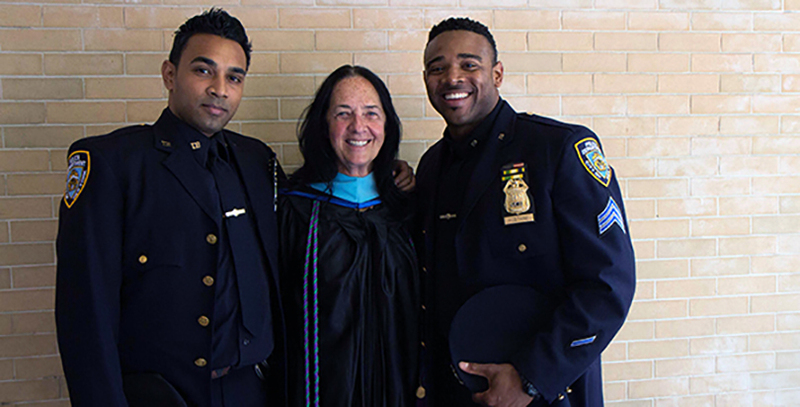 Those same cops later attended BSA’s 2015 inaugural graduation, congratulating many of the same students they had cuffed the day of the brawl. Next, McKeon identified 14 of “the usual suspects,” as she called them— students whose names were constantly surfacing among the teachers, in the classroom, on Facebook, in their neighborhoods — as the troublemakers. She divided the students into smaller groups, and assigned each group a teacher/mentor. Unlike a traditional mentoring system where meetings are periodic, the student and teacher checked in daily. They would go over the student’s behavior that day, review feedback from teachers, whether or not the student was late to school, if he or she disrupted class or had done the assigned work. There was a sense of investment — of the students in themselves and in BSA. “It helps me know that I have somebody to go to if I needed help or just to talk in school,” said one of the teens in an anonymous survey of the pilot program after its initial year. If the system could work for 14 students, it could work for the whole student body, McKeon thought. Armed with studies and tools to create personal relationships provided by the Harvard Graduate School of Education’s Making Caring Common Project, which helps schools and parents raise caring, socially responsible young people, McKeon expanded the program. It became the Champion Model, and McKeon assigned each student a teacher “Champion,” responsible for the student check-in and building a trusting, stable relationship with that young person. The results were impressive. One example, when McKeon started at BSA the attendance rate was around 68 percent. Today it’s at 87 percent. Now in its third year, the Champion program became a peer-to-peer experience in 2015-16 with juniors assigned to mentor freshman. Students, McKeon said, wanted to be Champions for their younger peers. For Kareem Brown and David Palmer, both 19, and Lyndon Villaroel, 20, McKeon’s arrival and the Champion model are the distinctive markers of the “before” and “after” of their high school lives. Villaroel, a tall young man from Trinidad, had been in a gang, was one of the students suspended for 25 days after the fight, and viewed as the Mayor of the Hall (and not in a good way). But in his junior year McKeon came to BSA and began to make changes. “I started to take into consideration that I do want to do big things in life and graduating from high school was the first step. I was starting to turn it around a little by little,” he told The 74. Soon, he and McKeon laughed, “It came to a point where I barely had to be told to pull up my pants.” He became the Mayor of the Hall in a good sense, with other students seeking him out to ask advice, including Palmer. Palmer, now an aspiring poet who had spent the afternoon sharing his work with BSA students, reflected upon his similar trajectory in school around the implementation of the Champion Model. During his suspension, Palmer was arrested again, this time ending up in jail on Rikers Island. Because he was only 16 at the time, he was considered a youth offender and allowed to return to school. Brown, now a student at New York City College of Technology, nodded as Palmer told his story, “He changed when he came back,” Brown said. Brown’s Champion encouraged him to pursue college and always made sure he was on track to do so, he said. “It’s much more personal, “ he said of the program, and when things got “too rumbly,” in his life, he sought counsel in McKeon. The respect the young men have for McKeon is palpable, as it is with the rest of the student body for their principal. 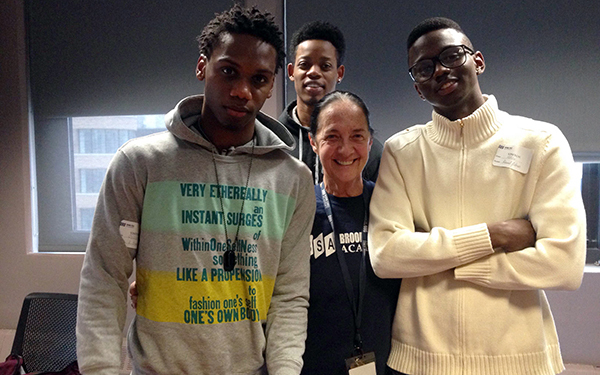 Principal Barbara McKeon with (from left to right) Kareem Brown,19, Lyndon Villaroel, 20, and David Palmer, 19. Throughout the afternoon, students continually knocked on her door to check in before the weekend and ask for their phones — confiscated during the day for being in use when they shouldn’t be. McKeon is easy and familiar with each of them, asking one if he managed to be on time to class (he had) and suggesting to another that he wash his sweatshirt before he wears it again (it smelled like marijuana). Despite the success of the Champion Model, there is still work to be done, McKeon acknowledges. “Do we have problems? Of course we do, we have teenagers,” she says. 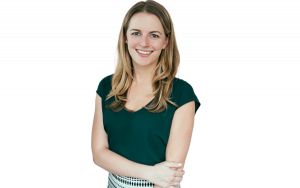 But McKeon prides herself on being “the champion of the underdog,” and credits her own upbringing for allowing her to connect with the student body. She grew up in Jersey City “before it was Jersey City,” she says, recalling the pre-gentrification neighborhood violence, and was the only one of her five siblings who went past high school. She now has her doctorate.